Drain flies sometimes appear suddenly and mysteriously, becoming a nuisance in both homes and sewage disposal plants. Adult flies may become so numerous indoors that they congregate at windows, darken lamp shades at night, fall into food and accumulate around showers, bathtubs, sinks and floor drains, especially in the basement. Outdoors they mar fresh paint and plug sewage filter beds (intakes and drains), getting into the eyes, ears and nose of people in the area. Bronchial asthma can be caused by inhaling fragments and dust of dead flies. Since these flies originate in filthy conditions, there is the possibility of human health disease transmission. 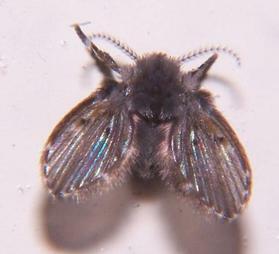 Drain flies reproduce in polluted, shallow water or highly moist organic solids. The eggs, larvae and pupae can be found in the muck, slime, or gelatinous film often accumulating on the sides of drains and overflow pipes in homes, or in sewage disposal beds, septic tanks and moist compost. They have also been found in dirty garbage containers, rain barrels and tree holes. Eggs, which can hatch in 32 to 48 hours at 70 degrees F, are laid in and on the moist media. Larvae feed on the decaying organic matter, microorganisms, algae and sediment in the media. Larvae mature in 9 to 15 days and are considered valuable organisms along with the organic film in purifying sewage water. Larvae live in the organic film, breathing through tubes and feeding on sediment, decaying vegetation, along with microscopic plants and animals in filters at sewage plants. Pupae occur in or on the surface of the breeding media and, after 20 to 40 hours, new adults emerge. They feed on flower nectar and polluted water. During the day, adults rest in shaded areas or on walls near plumbing fixtures and on the sides of showers and tubs. Most activity occurs during the evening when these flies are seen hovering about drains and sinks. They may breed in large numbers at sewage filter plants and then may be carried by prevailing wind to nearby homes up to a mile away. Adults are small enough to pass through ordinary window screening.